Signature : Ishido Fujiwara Korekazu Seitan. Meiji 2 nen 2 Gatsu hi. (February 1869). Blade length : 69.95cm or 27.54 inches. Sori : 0.8cm or 0.59inch. Width at the hamachi : 3.08cm or 1.213 inches. Width at the Kissaki : 2.355cm or 0.927inches. 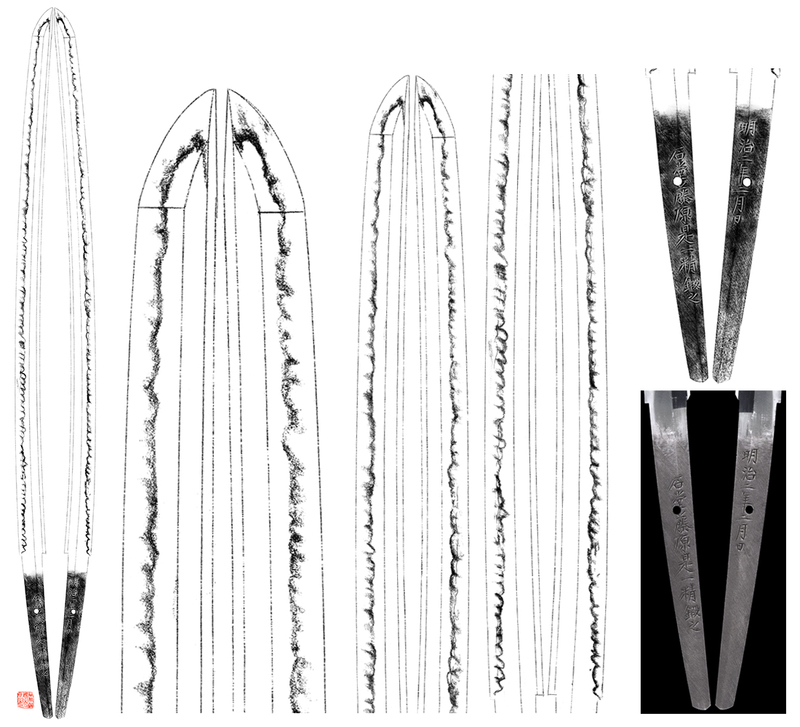 Kasane : 0.88cm or0.346 inch. Shape : The blade is wide and thick and also longer kissaki which is nice shaped sword. Jitetsu : Small Itmame hada well grained with much Jinie attach. Hamon : Niedeki Gunome and Suguha hamon with very thick Nioikuchi. In Hamon, there are many Ashi and sunagashi and Kinsuji work. 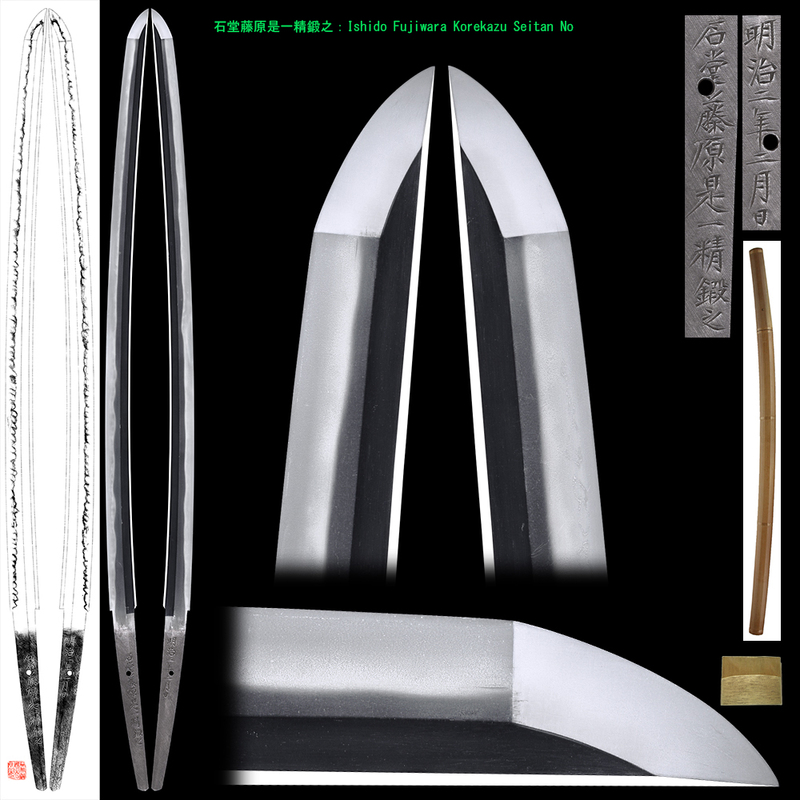 First generation Korekazu made Bizenden style with nice Utsuri but 7th generation Korekazu made swords like Sosyu style. 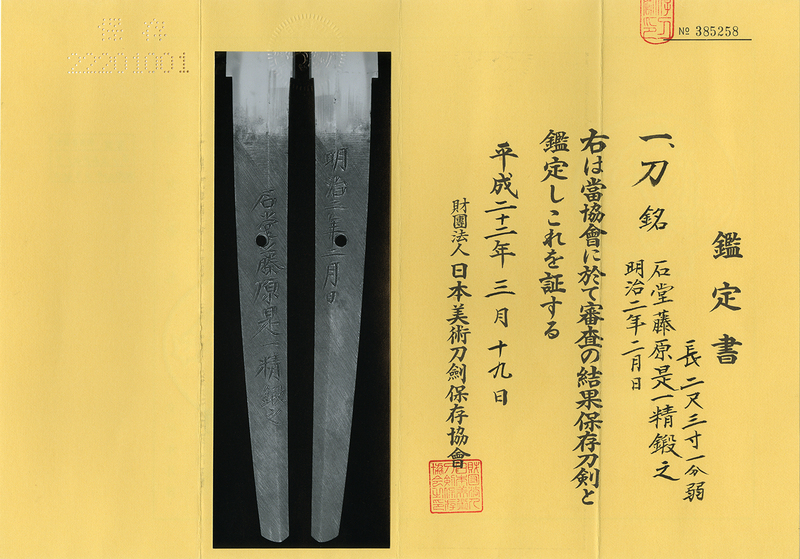 This sword was made meiji 2nd year but at that time, demanding Japanese swords are very few. Probably He tried to do the best for making this sword. Tsuba : Iron sukashi Tsuba. Echizen Kinai. Menuki : On the syakudo plate, a woman is engravedwith gold color. Fuchikashira : On the syakudo plate, a carp is engraved with gold color. The signature is mentioned as Iwamoto Konkan : I think not reliable but good item.